Portland is a city with one of the most diverse amalgams of brilliantly prepared cuisines anywhere in the county. American comfort food, fresh farm-to-table, unique Thai or Vietnamese—the City of Roses has it all. And there is no better vehicle for showing off that range than between two pieces of bread. Here, the sandwiches you can’t miss when you visit Portland. Who care about trends? A well-executed fried chicken sandwich will always have a place in our hearts (and bellies). 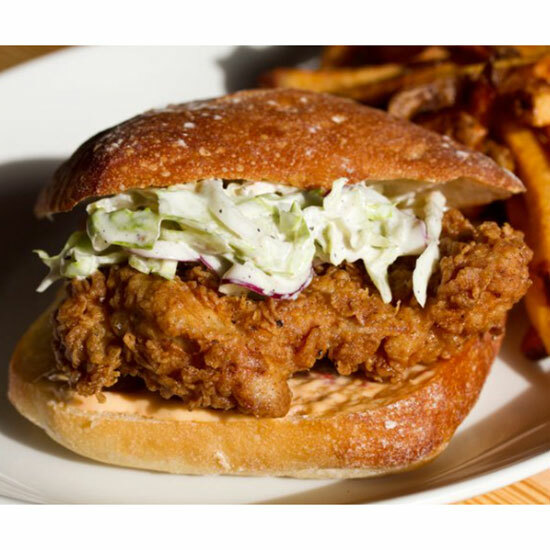 This one features a crispy chicken breast, blue cheese slaw, pickled celery and chili mayo. Just make sure to get it with the spicy lacquer. It’s worth the extra couple bucks, and sends this already heavenly combination over the top. The bread baked at this snug strip mall joint is so good, other restaurants use it to up their own sandwich games. If you can only get one thing, make it the BBQ pork banh mi. It’s a winning combination of sweet meat, bright vegetables, mayo, and perfect bread (of course). Oh, and did we mention that it will set you back just three dollars? Don’t even think about using your hands. Grab a fork and knife, and try to be as civilized as possible when taking this on. It’s outrageous looking (in the best way possible), and loaded up fried chicken, bacon, cheddar cheese, and white gravy. Postprandial somnolence (more commonly referred to as “food coma”) is inevitable. Delicious veggie sandwiches are nothing new, but this one stands out from the pack by starring the humble green bean. Here, they’re grilled to crispy perfection and topped with bacon relish, soft-boiled egg, Parmesan, and aioli. It’s so indulgent and satisfying that you’ll forget that you’re eating (mostly) a vegetable. This sandwich doesn’t stray far from it beloved Italian deli roots. Made with coppa, salami, and ham – all sourced from local pigs finished on hazelnuts for 60-90 days – iceberg lettuce, provolone, relish and mayo, the sandwich taste just as good hours later (in case you can’t finish in the first sitting). The now iconic sandwich – it was first popularized by Cuban immigrants in South Florida in the late 1890's – gets an upgrade with the help of slow roasted, molasses-glazed pork belly. The accompaniments stay true to the original, though, with sliced ham, Swiss cheese, and sour pickles. A flip on the grill ensures that each bite is irresistibly warm and melty. Just imagine thick slabs of herbaceous, fatty pork layered with even more rich goodness (hazelnut gremolata and caper mayo), then crowned with spicy arugula. A sturdy ciabatta keeps it all together, so you don’t have to worry about your sandwich falling apart before you’re through.